Looks great in the living room! Got it quick! Thanks! Good transaction, accurate description and fast shipping. THIS IS THE BLIND YOU'VE BEEN LOOKING FOR! BEST BANG FOR YOUR BUCK!!!!!!!! This thing came like brand new. Sets up in seconds. I had it up in no time, by myself, and it was easy. I'm a big guy and I could easily fit another person in there with me. I think three people would fit in this blind but it would be a bit tight. It folded down as fast as it went up. I got it back in the bag just as quick as I got it out. I was actually impressed. If you're on the fence about these blinds like I was, get this one. Great Blind Especially for the Price!! Great blind for the money! This is a great blind for the money. Don’t worry about it being refurbished. It’s been gone through and is probably better than new. Good size for 2 people and some gear. Easy to setup and take down. 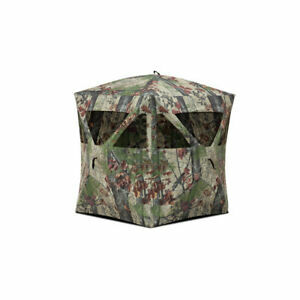 If you’re in the market for a great blind that won’t break the bank, don’t hesitate about this one. Really food for the price. I put it up under 2 minutes without even looking at the instructions. Well worth the money. I would buy it again.